Nails, Hair, Health, and Beauty- come experience over-the-top service without over-the-top prices. Our skilled stylists, specialists, and professionals are sure to amaze. And more... Call and Ask! 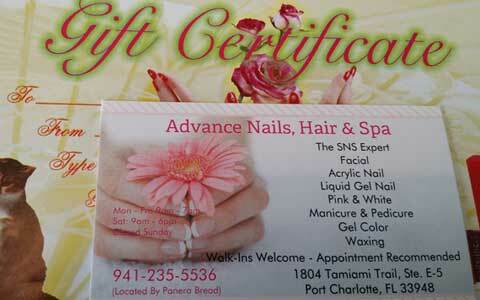 Our Gift Certificates Are Perfect For Birthdays, Holidays And Other Special Gift Giving Occasions. We offer a wide variety of nail services, from pedicures to manicures, UV gel nails, and everything in between. We have styling services for men and women, including hair cuts, beard trims, color, highlights, perms and more. We now offer Chinese reflexive foot and hand massage in addition to our permanent makeup and waxing services. We are a walk-in salon and an appointment is usually not necessary. However, for waxing services we highly recommend booking an appointment.